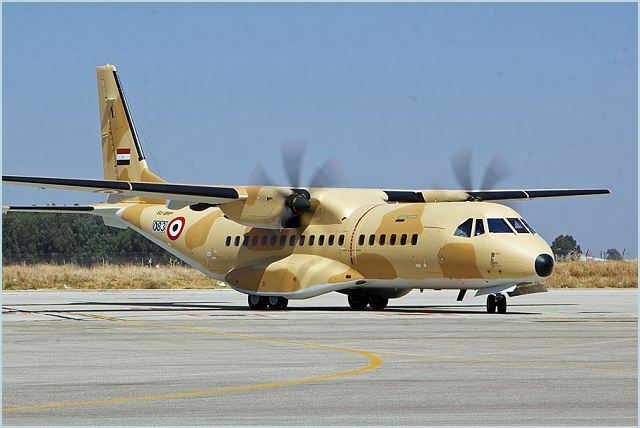 14:00 GMT, September 23, 2011 The Egyptian Air Force (EAF) today has taken delivery of its first Airbus Military C295. The aircraft in military transport configuration, was delivered ahead of contract schedule. This aircraft is part of a three aircraft order placed by the EAF in October 2010. The other two aircraft are to be delivered during the last quarter of 2011. The C295 was selected for its versatility and adaptability, especially in desert areas, its ease of maintenance and low life cycle cost, as well as its operational capabilities. “This milestone represents the birth of a strong Programme between Airbus Military and the Egyptian Air Force”, said General Yousry Abd El Hamid, Chief of Armament Department of the Egyptian Ministry of Defence. Airbus Military Head Programmes Light & Medium & Derivatives Rafael Tentor, said: “We are very proud to welcome the Egyptian Air Force to the Airbus Military community of operators and we look forward to support the entry into service of the C295. We are confident that the aircraft will have a long future with the Egyptian Air Force, operating efficiently in the challenging missions required from it”. The C295 is configured with standard equipment as well as the Cargo Handling and, Aerial Delivery system (CHADS). It can also be equipped for paratrooping and medical evacuation, and humanitarian relief missions. It can carry payloads of up to 9 tonnes, in standard cargo pallets, or 71 soldiers in transport missions, or be equipped with 50 paratroopers. To date, Airbus Military has sold 83 C295 aircraft to 12 different operators.